Join Alan Miltz author of MyCashflow Story and Neale Lewis , certified Gazelles International coach on a powerful one day Scaling Up Business Growth workshop. Bring YOUR LEADERSHIP TEAM for an information-packed day where you will create a roadmap to confidently scale your business growth in 2018 and beyond. The Four Decisions™refer to the critical decisions that growth companies must get right to maximise their revenue, profit and time. 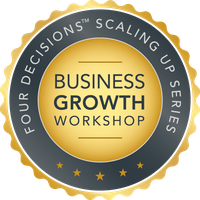 This workshop will teach you tools for making the right decisions to drive business growth in the areas of People, Strategy, Execution, and Cash.